How much does HORIZONTM cost? Regular: If your plan's balance is GREATER than $10,000 when you subscribe, the service costs $600 per year billed annually. Semiannual, quarterly and monthly payment options are available. JumpStart: If you have a plan balance of LESS than $10,000, you can subscribe to our Jump StartTM program offering you the service for just $300 per year for your first THREE years (or $360 per year on the monthly or quarterly plan)-a savings of up to $1,080! Both programs are covered by our Loyalty Pricing Guarantee—what you pay per year when you first subscribe will be the same as what you pay every year, for as long as you remain a subscriber. Click here to learn about all the advantages of our subscription-based service that make HORIZONTM an even better value. According to our most recent Customer Satisfaction survey, 97% of our subscribers reported that they feel that the HORIZONTM service is "well worth the fees paid." Are there any fees associated with making reallocations? No. If you are reallocating within a company plan or within investments held at a single mutual fund company, you will pay no fees for the transactions associated with reallocating your account. In fact, the fee you are charged by your plan administrator and/or mutual fund company (this fee is transparent to you) includes the ability for you to make reallocations. Some funds themselves charge penalties if you buy and sell them within specified holding periods. HORIZONTM will exclude most funds that include holding periods longer than 30-days. However, in cases where holding periods are unavoidable the HORIZONTM Reallocation Process and corresponding Reallocation Worksheet provided step-by-step instructions for avoiding any fees. Can I subscribe without using PayPal? Compass Investors accepts credit cards, checks and money orders for subscription payments. Please note that while we do require 1-year of payment in advance when paying directly by mail or with a credit card, your subscription is covered by our Subscription Refund Guarantee throughout the subscription period. And you may cancel at any time after your 60-day trial period and receive a prorated bi-yearly refund. If your plan balance is GREATER than $10,000...Click to access the mail order form. If you are just starting your plan, your plan balance is LESS than $10,000, or you or a member of your household are already a subscriber...Click to access the Jump Start mail order form. 1. If you are sending a personal check, your subscription will start once your check clears our bank (2-3 days after receipt). 2. For fastest processing, please let us know via email once you have mailed your check. 3. If you are a former subscriber, you will use your previous User Name and Password to access the members-only website. 4. Check subscriptions are not automatically renewed. You must remember to mail us a check (or enroll electronically using PayPal) each year. You will be reminded to mail in your payment when you sign on to your account within 30 days of expiration. We suggest that you put an annually recurring item on your calendar to remind you to send yours payment so that you do not miss any Action Reports. 5. Subscription rates for check or money order subscription renewals are based on the current subscription rate in effect at the time of renewal and are subject to change. What are the advantages of a subscription service? Besides the obvious advantage of significant improvement in your investment results, there are many advantages that come from how we charge for the HORIZONTM service. 1. Your fees will NEVER GO UP. When you subscribe with PayPal, we guarantee that what you pay per year when you first subscribe will be the same as what you pay every year, for as long as you remain a subscriber. 2. You pay a FIXED-FEE. The price you pay is NOT dependent on your account size. We do not believe you should be penalized simply because you happen to have a large account balance. 3. Your fees DO NOT REDUCE your portfolio value. Since you pay for our service from non-retirement assets, your entire retirement plan balance remains intact at all times. The result is a significantly higher overall value. 4. Your fees are TAX DEDUCTIBLE. If you itemize deductions on your tax return, our fees are TAX DEDUCTIBLE, further reducing the net cost to you. 5. We offer a lifetime SUBSCRIPTION REFUND GUARANTEE. Unlike any other financial planner or company, we put our financial well-being on the line every day by guaranteeing our subscribers that we will out-perform a formulaic asset allocation strategy. We know of no other financial services organization that is willing to refund any of their fees if their results do not outpace their performance benchmarks. How does HORIZONTM compare to "free" financial planners/companies? While you are not directly charged, rest assured your financial planner and/or mutual fund company are making money by "managing" your account, typically through subtractions from your portfolio that are not immediately obvious. You have to compare the RESULTS to determine how much you may be paying for that "free" advice. If you are satisfied with the results, and have already achieved Retirement Income Security, then you may not need us. However, if you would rather be delighted with your investment performance, then subscribe to HorizonTM. Our service comes with a 60-day risk-free trial and comes with an industry-first Subscription Refund Guarantee. How do your guarantees work? We invite you to evaluate the service, study our archives of past Model Portfolio allocations and go through our easy-to-follow Reallocation Process to see for yourself just how straight-forward it really is. If you are not 100% satisfied, you may cancel for any reason within the first 60 days for a no-questions asked refund. Compass Investors provides its subscribers with an unprecedented Subscription Refund Guarantee directly tied to our performance. Click for details. No other investment analysis service, financial planner or mutual fund company we know of offers any service fee refund guarantees. For as long as you remain a subscriber, your yearly renewal cost will never increase. Can I use HORIZONTM if my company or mutual fund group is not listed? 1. We are constantly investigating new company plans and mutual fund companies to add to our HORIZONTM service offering. Please contact us to inquire how your company's plan or mutual fund company might become the focus of our next offering and how you might be able to assist in helping us to offer the service to your employer. 2. If your employer plan offers a Brokerage Window, you may be able to use any of our current offerings to enhance your plan's performance. Again, please contact us to inquire how to get started with this option. How soon after I subscribe will I receive my first HORIZONTM Action Report? A new HORIZONTM Action Report is published every five weeks. Depending on where in the publishing cycle you signed-up, you should receive notification of your first Action Report no later than five weeks from the time your subscribe. We will send you an email immediately after each new Action Report is posted to the web site. What does having Retirement Income Security mean? Compass Investors defines Retirement Income Security as receiving an amount of money equivalent to your final salary, every year of your retirement, for as long as you live. This means NEVER having to worry about running out of money AND having the financial flexibility to live your retirement years as you deserve after your lifetime of hard work. How do I ensure my Retirement Income Security? Most importantly, you will need to amass an amount that is equal to twenty (20) times your final salary. For example, if that salary was $50,000, you should save $1,000,000 (i.e., 20 x $50,000). Then, invest this amount in one of several options (i.e., fixed income bond fund, guaranteed annuity) that guarantee at least a 5% annual return. The interest alone will provide a yearly income equal to your final salary-forever! For example, $1,000,000 invested at 5%, would yield $50,000 every year. ($1,000,000 x 0.05 = $50,000). The best part is that your initial investment remains in tact and is available to you throughout all your retirement years to improve your quality of life or respond to unforeseen needs. Why is my retirement plan essential to Retirement Income Security? Compass Investors believes that you should never depend on anything you cannot personally control. Most of your potential retirement income sources are outside your control. Social Security and Medicare are significantly underfunded; pension plans are being reduced or eliminated; real estate is not the wealth-producing vehicle it once was. The ONLY truly reliable retirement income source that you can directly affect is your retirement plan. Therefore, it is imperative that you take all necessary steps NOW to grow and protect this cornerstone of your Retirement Income Security. Your rock-solid retirement plan will ensure your future happiness and financial security—the perfect combination for worry-free golden years. If other income sources continue to be available, then you are ensured an even higher standard of living. Regardless, in this highly unstable and turbulent world, you will be confident that you have grown your retirement account large enough so that your family will be secure forever. Shouldn't I be able to live on less money once I retire? Compass Investors believes that you should be highly conservative when planning for your future. Actuarial tables show that once you retire, you are likely to spend two or more DECADES without a steady income. You will be far better off setting an aggressive financial goal and netting more money than you actually need than having to reduce significantly your standard of living or be forced to return to work because your cost-of-living estimates were too low. All costs will continue to increase—particularly those for medical and energy. Pension plans are either being eliminated or are under-funded; the future of Social Security is in doubt. Additionally, higher interest rates and inflation are strong possibilities. To be prepared for these and other future unknowns, Compass Investors—along with other financial experts at Morningstar and Wharton—strongly recommends that people who are retired be able to replace 100% of the salary they had prior to retirement. Doing so will help you avoid the unthinkable—running out of money when you are no longer working. Getting a job as a senior also may not be a viable or desirable option. You only get one chance to amass the money you will ultimately need and it is important to consistently do it right during your working years. Will increasing my contribution level alone help me have Retirement Income Security? No.For your investments to grow large enough to provide you with Retirement Income Security it is necessary to couple contributions with higher long-term expected returns. Asset allocation is an investing strategy whereby you diversify your portfolio amongst the various kinds of possible investments. Investment choices are categorized according to which ASSET CLASS-stocks/equities and bonds/fixed income-they belong. Formulaic asset allocation is a "set-it and forget-it" style of investing—the familiar "pie chart" that most people have seen and are familiar with. What are the flaws of an FAA strategy? While FAA may be appropriate for some investors and represents a viable strategy opposed to the uncertainty of making investment decisions on your own, any FAA approach has several inherent flaws. These must be fully understood and considered when deciding which approach is best and most comfortable for you. For example, during recent severe down markets (2000-2003, 2008) an FAA strategy would have required that you hold a large percentage of your money in stock funds— losing money for the entire 3-year period. During each subsequent market recovery, an FAA approach would have a large percentage of your portfolio invested in bond fund alternatives—even though they historically lose money in strong up markets— resulting in severely reduced growth.. Investing with FAA is similar to driving with one foot on the brake and one on the accelerator at the same time—you will not go very fast and you will end up wearing out your brakes! What is Adaptive Asset AllocationTM (AAA)? Unlike traditional asset allocation strategies that have been popularized by Target Date Funds, Life Cycle funds and managed accounts, Adaptive Asset AllocationTM does NOT follow a preset formula. Instead, AAA seeks to have your portfolio consistently invested according to how the market and economy are performing, i.e., your funds are always best positioned to work WITH, not AGAINST, the market's prevailing direction. An essential part of an AAA approach is that your current allocations are reviewed much more frequently—10-11 times per year versus the 1-4 times for a traditional approach—so that you are paying much more attention to ensuring the alignment of your investment choices with the market direction. As it becomes evident that an upward moving market has leveled off and started to decline, an AAA strategy would begin to shift money out of stock funds and into bond funds. During a sustained down market, there will come a point where an AAA model has moved ALL investments into bond funds, thereby protecting the portfolio against sustained loss —losses that could take years to recover from. Similarly, at the conclusion of a down market, the reverse happens. AAA strategy gradually begins to shift money back into stock funds and out of bond funds. There will come a point when the AAA strategy has moved ALL your money into stock funds, thereby maximizing the portfolio's gain opportunity. HORIZONTM is a computer model, consisting of millions of calculations that analyze a finite collection of mutual funds such as you would have in an employer-sponsored retirement plan or IRA. These calculations mathematically determine which fund choices are best aligned with current market conditions. HORIZONTM analyzes and suggests adjustments to your portfolio's fund holdings using an objective process that yields outstanding results. The output of the model, along with simple-to-use reallocation instructions, are made available to subscribers via the HORIZONTM Action Report that is updated every 5-weeks. The HORIZONTM Model Portfolio, included in every Action Report, lists each available fund in your portfolio, and shows the exact percentage of the portfolio that is being invested in each one. How do FAA performance results compare to Horizon'sTM? The nearly two decade history of HORIZONTM demonstrates long-term investment returns that are several percentage points HIGHER than the BEST performing professionally-managed target date fund (TDF), all of which follow a traditional asset allocation approach. Due to the extraordinary effect of compounding, this higher investment return results in long-term portfolio values that can be at much as 300%+ GREATER. Click here to see the performance chart. How do I know the HORIZONTM model and results are valid? Our objective process and calculation of results were independently by Ashland Partners & Company, LLP. Founded in 1992, Ashland offers compliance verification, consulting, and performance examination services for the investment management industry. Their engagement, concluded in 2006, was conducted in accordance with attestation practices generally accepted in the United States. Compass Investors is a member of the Profit Sharing/401(k) Council of America (PSCA). Is HORIZONTM right for everyone? HORIZONTM is a self-managed approach that requires a commitment of time needed to review and possibly reallocate your investments every five weeks. If you are (1) willing and able to invest approximately 10 minutes every five weeks, (about 2 hours a year), and (2) you are interested in securing your financial future, then HORIZONTM could be the right service for YOU. It does require this minimal amount of your attention, but the reward for creating your own Retirement Income Security is priceless. Is HORIZONTM an aggressive or risky strategy? When someone asks about "risk" they are typically referring to investment risk, or in other words, the amount of fluctuation you are willing to accept in your portfolio's performance from one year to the next. Investment risk is defined on a continuum from "conservative" (most of your money in bonds and cash and therefore little fluctuation) to "aggressive" (most of your money in stocks, high fluctuation). Because of the adaptive nature of HORIZONTM, the investment risk changes depending on what the market is doing. So, for example, when the market is clearly going up, HORIZONTM may be 100% invested in stocks and therefore would be labeled "aggressive." And the opposite is true during extended down markets when HORIZONTM will likely be 100% invested in bonds and cash which would be considered very "conservative" from an investment risk perspective. However, there is another risk that we encourage people to consider called Retirement Income Security risk, or how likely you are to run out of money before you die. There are few people who are willing to take an "aggressive" posture here. Because of the significantly higher long-term investment returns that HORIZONTM delivers, we can safely say that your risk for running out of money before you die is substantially reduced compared to any other investment strategy. HORIZONTM Adaptive Asset AllocationTM offers the most desirable ratio of investment RETURN to investment RISK resulting in the lowest Retirement Income Security risk because your investments will always be positioned to work with—rather than fight against—the changing tide of market and economic realities. In summary, the HORIZONTM strategy is not focused on "aggressive" growth; it is focused on achieving OPTIMIZED performance. Is HORIZONTM a "Market Timing" strategy? HORIZONTM is a market adaptive approach, which analyzes current realities and adjusts portfolio allocations accordingly. We do NOT "speculate" on which way the market is going or when it might change direction. HORIZONTM responds to the conditions at hand and suggests frequent reallocations that best position your portfolio to benefit from current market conditions. Where can I see a sample Action Report? Each Action Report consists of the following two main sections. Current Subscription Refund Guarantee Results. A performance chart comparing Horizon's performance to its two performance benchmarks. Model Portfolio Allocations. A table showing each of the funds available to you, and Horizon's score of each fund and corresponding percentage allocation. Click to see a sample Action Report for one of our company supported plans. How can I use the information provided in the Action Report? You may use the Action Report's Model Portfolio in one of three ways. 1. Apply the Model Portfolio EXACTLY to your portfolio. 2. Apply the Model Portfolio to a PORTION of your portfolio. Some subscribers apply HORIZONTM to a percentage of their portfolio until they become comfortable with the process and begin to see the results for themselves. Others want to keep a percentage of their portfolio in fixed income investments at all times and use HORIZONTM to manage the remainder. The HORIZONTM model will never consider company stock in the Model Portfolio due to over diversification concerns (think Enron, United Airlines). However, if you want to—or are required to—hold company stock, then you can use HORIZONTM to manage everything else. 3.Use the Model Portfolio to CONFIRM your decisions. HORIZONTM is designed to help you make better-informed reallocation decisions, but not necessarily to be the ONLY source. For the more astute investor, the analysis provided by Compass Investors may be just one source of information they use to confirm their own reallocation decisions. Regardless of which approach you use, the very fact that you will be reviewing your account 10-11 times per year virtually assures that you will assume less risk by being properly aligned with the market. How does the HORIZONTM computer model decide what funds to invest in? The computer model follows a 5-step process. 1.Each mutual fund in your portfolio is first divided into multiple time slices. 2.Next, the direction (up or down), degree (angle of movement) and the duration (elapsed time) of each time slice are evaluated. 3.A weighting is then applied to each time slice. 4.The sum of each of the time slice weightings are added together to produce the Score for the fund. The Score is included in the Action Report. 5.A percentage-holding amount is then determined for each fund based on the relative Scores of each of the fund choices. The Percentage is included in the Action Report. The number of time slices, the weighting algorithms and the percentage amounts are the results of five years of extensive study by the Compass Institute. They tested over 500,000 possible permutations of factors to come up with the correct combination that would provide the optimal results when applied to any combination of mutual funds. Do I have to follow the HORIZONTM Model Portfolio exactly? It is important to remember that you are ALWAYS in control of your reallocation decision. Most subscribers follow the Model Portfolio exactly, as it has been proven to provide excellent results. However, for whatever reason, you may occasionally want to do something different than what the Model Portfolio may suggest. The HORIZONTM computer model does not try to predict or call the tops or bottoms of markets. Rather, it adapts your portfolio to the ever-changing market tide as it unfolds. HORIZONTM is designed not to OVER react – that is, move out of or into a fund too soon – and you may feel that our analysis may be slow to react to what you (or others) believe may be a changing market. While it would be ideal if the model would get you into and out of each fund at exactly the right time, this is not realistic. But once a market direction is confirmed, you can be assured that HORIZONTM WILL properly position you for the next sustained moves, either up or down. Meanwhile everyone else will remain locked into increasing losses (in down markets) or reduced gains (in up markets) due to following a formulaic approach. EXAMPLE: If you firmly believe that the market is going to go down and want to respond more aggressively to the Model's move into fixed income funds, then you may elect to move a larger percent of your money into those "safer" investments sooner. Sometimes you may be better off doing that, and other times you may not be. Nevertheless, that kind of guess work is what gets most people into trouble, as the markets do not always respond to logic. Regardless of which way you choose, the very fact that you will be reviewing your account 10-11 times per year virtually assures that you will assume less risk by being properly aligned with the market. How does HORIZONTM help me work with fund restrictions? Fund restrictions come in two "flavors": holding periods (how long after you buy a fund you must wait before you can sell it) and repurchase blocks (how long after you sell a fund that you can buy it again). Taken together these are often referred to as roundtrip rules.In addition to being cumbersome to navigate, violations of these rules can result in fees or trading restrictions being imposed by the fund company. To help you manage this process and ensure that you do not incur such penalties unnecessarily, HORIZONTM subscribers are provided with a Reallocation Worksheet. The Reallocation Worksheet is an Excel spreadsheet which is pre-populated with the recommended allocation percentages and programmed with any applicable fund-specific rules and restrictions. Depending on the features provided by your fund/benefits/brokerage company, you can automatically import your current balances and transaction history and the Reallocation Worksheet will generate specific transactions that ensure you will not violate any fund restriction. While you are always in control of your investment decisions and may elect to take a penalty (e.g., you feel that a fund might drop further than the penalty you would incur by selling it early) our philosophy of keeping costs to a minimum would direct you to hold the fund and avoid any penalty. 1. 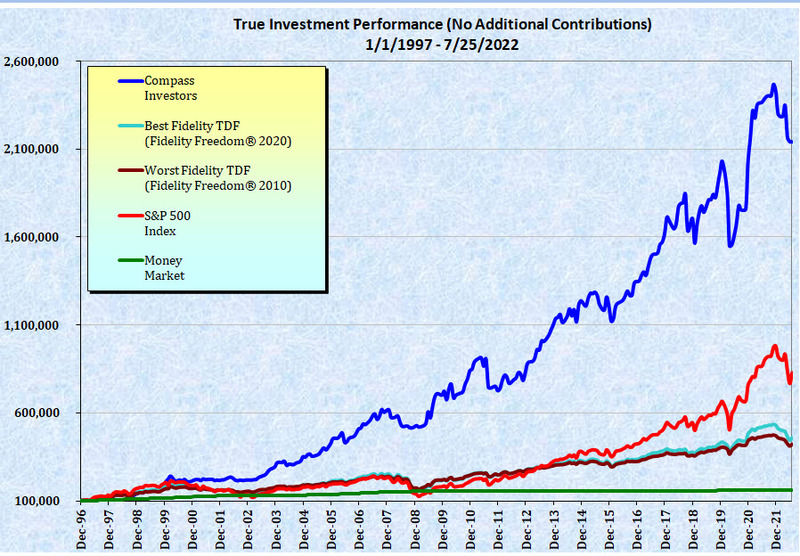 When we move OUT of a fund it doesn’t necessarily mean that the fund is in trouble or that it is a bad fund. It simply means that there are better places for your money within your available investment choices. 2. Despite our more frequent reallocation strategy, we encourage subscribers to always take a long-term view. For example having to hold onto a fund or having to wait to buy a fund for an extra 30- or even 60-days is immaterial when considered within the timeframe of the typical retirement planning horizon of 11 THOUSAND days (roughly 30-years) and will have little impact on your overall results. Remember, we are trying to put you in the best positioned place while simultaneously helping you to avoid fees. Why are target date funds and balanced funds excluded from the HORIZONTM Model Portfolio? Target Date Funds (TDF) are typically constructed by the mutual fund company using proprietary stock and bond funds to follow a traditional asset allocation approach, having a pre-determined and fixed percentage mixture of stock and bond funds. TDFs and most balanced account funds represent in and of themselves a set-it-and-forget-it strategy that our Adaptive Asset AllocationTM strategy both competes with and has been proven superior to. Also, the Compass Institute back-tested fund collections both with and without TDFs and found that the long-term performance of HORIZONTM was better for those portfolios that excluded TDFs. How can I use HORIZONTM to improve my non-retirement investments? 1.Open an account (if you do not already have one) with any of the mutual fund companies or brokerage firms that are currently supported with HORIZONTM. NOTE: If a company you want to invest with is not yet listed, please let us know as we are always adding support for new entities. 2.Decide what portion of your non-retirement investments you want to manage with Horizon. 3.Transfer that money directly into the cash account or money market fund of your chosen company. 4.Once your account has been opened return to our website and subscribe to one of the plans for your chosen company. Then, just as you do now with your retirement plan, you will receive a HORIZONTM Action Report every five weeks. You may implement any desired reallocations using the mutual fund or brokerage firm's web site and our Reallocation Process. Best of all…if you are a current subscriber, you are entitled to a 50% discount on each additional HORIZONTM subscription for your first three years—an up to $1,080 savings! How can I use HORIZONTM with an IRA? You can take full advantage of HORIZONTM with ANY collection of mutual funds or exchange traded funds (ETF). You just need to have your IRA with one of the mutual fund companies or brokerage firms we support. Can I use HORIZONTM with my MUTUAL FUND investments at a third-party broker (e.g., Schwab)? The answer depends on the characteristics of your current brokerage account. There are 3 fundamental concerns that must be addressed when using HORIZONTM (or any active management approach) to rebalance a portfolio of MUTUAL FUNDS at a brokerage firm (e.g., Schwab, Ameritrade, etc.). 1. More complicated rebalance process. Brokerages typically do not offer fund exchange capabilities. Therefore, to rebalance your account across the mutual funds in your account you must manually enter each buy and sell transaction. Most mutual fund companies offer some form of an exchange feature. 2.Timing of exchanges. Since you do not have fund exchange capabilities, each SELL transaction that is part of your rebalancing must first be submitted to your brokerage and then cleared by the mutual fund company (i.e., the proceeds from the sale need to be available to you in your brokerage account) before you can use those proceeds to enter the corresponding rebalance BUY transactions. Depending on the brokerage this could add 1-2 days to the rebalancing process. When working with a mutual fund company you are exchanging within the same family of funds so there is no time delay. 3.Increased Cost. You may have to pay transaction fees to your broker for each buy and sell transaction needed to rebalance your account. For example: To rebalance from one fund into 5 other funds requires a total of six (1 buy and 5 sell) transactions). To rebalance from 5 funds into 5 different funds may require as many as 25 transactions! Obviously if you are paying for each one, your gains will be reduced. There are no fees when making exchanges directly with the mutual fund company. The bottom-line is this: Following a disciplined, active approach of rebalancing a portfolio of mutual funds held at a brokerage firm may result in more time spent and more money out of your pocket – neither of which are desirable or sustainable by the average individual. If you want to apply HORIZONTM to mutual fund investments outside of an employer retirement plan we suggest you consider using one of the many commission-free ETF plans we support. Click here to see a current list of supported plans. Best of all…if you are a current subscriber, you are entitled to a 50% discount on each additional HORIZONTM subscription for your first three years—an up to $1,080 savings! Can I use HORIZONTM with EXCHANGE TRADED FUND (ETF) investments at a third-party brokerage firm (e.g., Schwab)? 1.Open an account (if you do not already have one) with any of the brokerage firms that are currently supported with HORIZONTM. 2.Decide what portion of your portfolio you want to invest in exchange traded funds and manage with HORIZONTM. 3.Transfer that portion directly into a cash account at your chosen brokerage firm. 4.Sign up for one of the HORIZONTM exchange traded fund (ETF) plans for that brokerage firm. You will receive a HORIZONTM Action Report every five weeks. Follow our Reallocation Process Document and enter your desired reallocations using the brokerage firm's web site. Can I use HORIZONTM with a 529 plan? HORIZONTM can be used for ANY collection of mutual funds—provided you are given the flexibility to rebalance your account. The challenge with most 529 plans is that you are NOT given much flexibility with respect to your investment choices. With most 529 plans you have 2 paths you can take: (1) you pick the option that matches your child's age and your risk level, and then the provider gradually moves you to more conservative allocations as college gets closer, or (2) you pick a pre-determined “risk” portfolio that is managed for you. Unfortunately, the expected performance of such rigid portfolios—i.e., they follow a traditional asset allocation approach—are inferior to those of the Adaptive Asset AllocationTM approach used by HORIZONTM. There are, however, other options for saving for your children’s education besides the 529 plan that have advantages such as additional investment flexibility. If you are interested in learning more about those alternatives, contact us and we will put you in touch with a certified financial planner who will be pleased to offer you a free consultation. Please note that while we receive no compensation from these individuals, they have earned our trust in how they have serviced other subscribers in the past. If the 529 you are considering happens to offer flexibility with respect to your investment choices, please let us know and we can see if we can help you with that. I am retired or nearing retirement. What does HORIZONTM offer me? Compass Investors encourages people to always have their financial assets best-positioned to be market responsive REGARDLESS OF THEIR AGE. If you have already reached the Retirement Income Security goal—being able to live off the interest alone of your investments—then your journey may be considered complete. However, if you have not, or perhaps you desire to improve your standard of living in retirement and be better prepared to handle any unexpected issues that could arise, we suggest you continue on your "journey." Our methods never change—only the amount of money you manage with it does.Since you could (if you are healthy) expect to live another 20 years or more in retirement, we believe you should always have your money working for you. The HORIZONTM Adaptive Asset AllocationTM strategy is designed to safely and consistently seek returns that are superior in any market, at any time. Therefore, our methodology removes the need to apply artificial age and risk dependencies in determining the best-positioned investment holdings. An important study of six traditional retirement strategies concluded that none could ensure surviving to age 100 except in cases of unreasonably low withdrawal rates. The article by Charles P. Jones and Jack W. Wilson, "Asset Allocation Decisions—Making the Choice Between Stocks and Bonds" published in the Journal of Investing (1999): p. 51–56 states, "The historical return patterns of asset classes do not support the common advice to increase bond percentages with age. Over time, the real return on bonds is not only small, but declines." Our methodology agrees with and incorporates Jones and Wilson's findings. Other than government-mandated retirement plan withdrawal requirements, HORIZONTM focuses subscribers—regardless of their age or employment status—on creating and preserving retirement income security at all times. Given the increase in life expectancy, this requires a growing and maintaining a nest egg that must replace a steady income for potentially several decades. Retired subscribers who want part of their assets in stable value/fixed income vehicles use HorizonTM to manage the remainder of their portfolio. And your required withdrawals will make this happen automatically. This creates a more traditional looking self-managed approach where the non-fixed income component is allocated using HORIZONTM. For some retirees, this combination provides greater peace-of-mind as they remain aligned with their personal objectives. Upon reaching retirement, the LAST thing you would ever want to adopt is an "aggressive" or "risky" approach. How can I ensure that I receive all email from Compass Investors? To ensure you receive all the email that we send, you must add the compassinvestors.com email DOMAIN and compass[email protected] email ADDRESS to your address book and/or list of approved senders. Email will never be 100% reliable and we therefore recommend you also do the following so that you will always know when a new HORIZONTM Action Report is available. Add a repeating reminder to your calendar scheduled to occur every 5th Monday. Note that if the markets are closed on Monday, the report will be posted the following market day. Periodically review your spam/junk folder to check for legitimate emails that have ended up in there. While most email providers allow you review mail they have flagged as spam, some do not. If that is the case, email them and complain. If you do get a chance to review email classified as spam, learn how to make the best use of your ISP's solution. For more information, please refer to How do I ensure that emails from Compass Investors are not treated as Spam? for instructions on how to avoid having our email treated as spam by your email provider/ISP. You may also wish to check our more comprehensive instructions that address several popular mail programs and third-party spam/junk filtering programs. I am having problems accessing the website. "Updating Internet Explorer V6.0+ for Proper Site Access?" When I sign-on to the website, I only see a blank page and/or hear a sound. The most common cause of seeing a "blank page" when trying to access the Compass Investors website is that your web browser's pop-up blocker is blocking part of our site's Log In process. This typically happens either when you have more than one HORIZONTM subscription, or if you have an active account that was previously cancelled or suspended. To log in to our site, you must instruct your browser to allow pop-ups from compassinvestors.com. And do not worry -- you will never see any of those annoying pop-up ads when using our site as Compass Investors accepts no advertising. Please refer to this third-party article that provides instructions for disabling the pop-up blocker for a specific website for several different browsers. If that link does not provide you with enough information, please consult your software's user manual for detailed instructions. If the above steps do not correct the problem after closing all web browsers and/or rebooting your computer, Follow the steps in our "How to correct Reallocation Worksheet/Action Report Display Issues" reference guide. I cannot access the Reallocation Worksheet and/or Action Report. If you are having trouble accessing the Reallocation Worksheet and/or Action Report from our website, it is likely that you have security features in place with your browser that require you to take additional actions to see these website features. If, after entering "I agree" (NOTE: Do NOT include the quotation marks) and clicking the "View..." button at the prompt provided immediately after your selection, look for a yellow banner near the top of the blank page (see example that follows). Move curser over message in the yellow banner. Right click, select Download File. Follow the remaining prompts to download and open the file on your computer. Safari users, please consult this page for more information on allowing pop-ups: www.ehow.com/how_2033317_manage-popups-safari.html. I get a blank page when trying to load the Reallocation Worksheet and/or the Action Report. The most common cause of seeing a "blank page" when trying to load the Compass Investors Realocation Worksheet or Action Report is that your web browser's pop-up blocker is blocking part of our site's file access process. To access files from our site you must instruct your browser to allow pop-ups from compassinvestors.com. And do not worry -- you will never see any of those annoying pop-up ads when using our site as Compass Investors accepts no advertising. There are two things you should try. Note: These instructions are for Internet Explorer V5 and higher. If you have an older browser or a different browser, please consult your browser's help file for specific instructions or visit this webpage. Close ALL browsers that might be open on your computer. The Reallocation Steps on my Plan Worksheet show errors like #VALUE and #NUM. The HORIZONTM Reallocation Worksheet uses Microsoft Excel functions that are only available in Excel version 2002 or later. If you are using a version of Excel older than Excel 2002, you may wish to consider upgrading your software to a more robust current version. If you are using a more current version of Excel, please make sure that you have entered only numbers (i.e., no blank spaces or non-numeric characters) in the worksheet. Their service is top-notch--they quickly answered my questions, gave me ideas, and resolved any issues. It is very affordable and an amazing value--unique in the marketplace. Where else can you get guarantee."